It may seem like there are as many possible artistic goals, and strategies for achieving them, as there are artists, but it’s not really true. 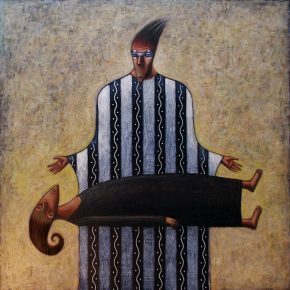 Just as the number of genres remains finite—landscape, portrait, figure, still life, and so on—and the variety of qualities, like abstraction, representation, or expression, while infinitely graduated, still ranges among a few fixed stars, so artistic strategies constitute a familiar set of options. 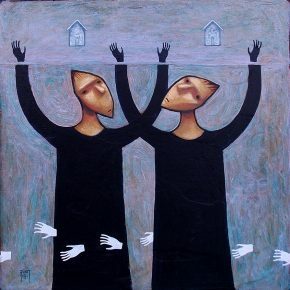 One artist may employ visual contrasts, her works playing well-known techniques, styles, moods, or other measures off each other. Another may choose a single look and concentrate on making it as deep as he can. And a third may strive to invent a completely new visual strategy: in essence, a new visual language. This month, Finch Lane Gallery presents three artists, each of whom typifies one of these three options. Tess Cook first turned up a few years ago with a number of very small canvases, each just large enough to contain the setup and punch line of the sort of joke that is funny in a picture, but would be disturbing, or worse, in person. Her paradigm was a species of crab cake: an uncanny zoomorph in which a hermit crab, instead of wearing the discarded shell of another marine organism, was seen dressed in a delicious-looking pastry. Puns are a matter of taste, but Cook intensified the confrontation by linking the irresistibly inviting with a threat so ancient and deep-seated it seems to come from each viewer’s own DNA. The punning verbal keys to these works paled into insignificance before the suggested possibility of biting into voluptuous frosting, expecting a rich mouthful of cake, and finding instead the overgrown insect-body of a crab. It was funny at a conceptual distance, but once visualized up close, it made a cerebral encounter that could not be unthought. 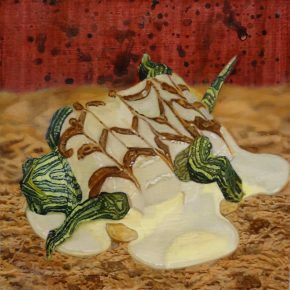 That Cook brought preternatural skill to her representations of the denizens of both pastry case and sea floor made the tableau so real, the encounter so intense, that laughter became as much defensive as aggressive. Because of their small size and resulting focus, those early panels recalled the work of Wayne Thiebaud, the locally grown American master who limns simplified desserts and candies on plain, solid-colored backgrounds. In Food Fight, though, Cook’s new works have grown in size and ambition. On these medium-sized canvases, she’s enlarged her creatures to show even more detail, and while a few, such as “Strawberry or Cake Walk,” in which a cupcake bearing six birthday candles is grafted to the working parts of a blue crab with orange claws, still dwell in one of Thiebaud’s cool, creamy voids, Cook more often creates contrasting settings, filled with bravura painterly effects against which the realism of the foreground subjects pops out all the more. Take “Containment,” for example. Here an elegant baker’s display bell on a white base contains a stack of two round macaroons, the trendy Venetian pastry that from now on will always resemble the shell of a slider, the popular pet store turtle whose striped head and legs here protrude from the pastry’s ruffled pied. True to her painterly impulses, Cook has carefully cataloged the array of optical effects produced by the glass bell, as though to assert that she is an objective observer, her apparent disinterest marred only by the tongue planted so firmly in her cheek. Another set of optical effects can be found in “Solitary Blues or Jelly,” the transparency of the latter dessert permitting seeds to float within while contrasting with the frosted surface of yogurt-covered pretzels below. 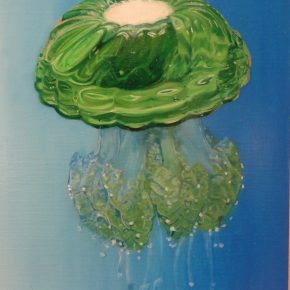 Cook’s backgrounds also display a catalog, primarily the intersections of realistic underwater environments and the painterly gestures that often produce them. “Power Struggle” employs watercolor stains among its techniques, while “Napoleon Melt Apart” juggles photorealism, in part a shallow-focus effect, against droplets—real and rendered—on parallel brushstrokes. Here, for once, the pastry seems to have the upper hand, as though overwhelming the turtle that lies on its back below. In “I Scream, You Scream, Then We Eat Ice Cream,” paint ran down a blank canvas that was then up-ended to produce a rising effect analogous to smoke, bubbles, or floating seagrass. If one boundary Cook confronts in Food Fight is complexity, with so much going on in “Coup d’etat” and “It’s a Wild World” that clarity suffers, another limit may be how disturbing an image can be and still be enjoyable. 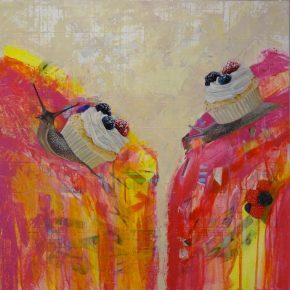 In some canvases she documents the Darwinian struggle to eat or be eaten, so that in both “Courage” and “Cravings,” the harmless, eagerly anticipated biting open of the bonbon coincides with the animal’s disemboweling. But of course it’s all just a figment of the imagination, and part of the way Tess Cook has found to pull and push an audience off-balance, which is something good art has always sought to do. Wherever she goes next, Tess Cook will be followed by an enthusiastic audience that shares her appetites, even if not yet sure where they lead. 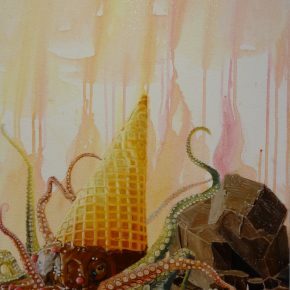 All of Food Fight’s contrasting colors, forms, atmospheres, and levels of detail stand, in their dancing vitality, in contrast with the painting of Grant Fuhst. 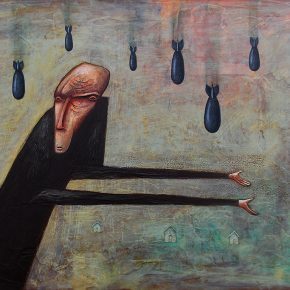 Painting, singular, feels particularly apt here, because Fuhst’s room full of ”anthropophobic” figures are all trapped in the same dire predicament, as though the canvases of The Yearning Curve were all windows that open into the same featureless void. It’s a frequently two-dimensional space in which things remain as ominous as they first seem. “The Optimist,” despite his hopeful title, doesn’t enjoy fielding falling destruction, while the couple in “The Hands Speak” must use their hands while dwelling under water. This world seems preoccupied with authoritarian issues, which to be fair is the American public’s predicament-du-jour as well. Change the haircut and the powerful figure in “The Re-Education of Sub-Atomic Particles” could be candidate Trump, having hypnotized a catatonic nation into believing that he alone can elevate it to safety. 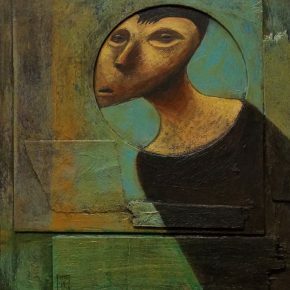 Four small mixed-media works, “Traveling Light,” “Quest, Dreamers,” and “Above,” capture the paradigm, each placing a prolate spheroid-shaped head within a three-dimensional circle. It could be a comment on the popularity of football, but it seems more to do with the common sensation that the intersection of irresistible forces external to us determines our fates. This may sound like someone who doesn’t like Fuhst, or worse, doesn’t respect his artistic prowess. Nothing could be more untrue. These works are instantaneously accessible, which is no mean feat, and they present a consistent and coherent view of a world anyone can identify with on the right (dreadful) day. At the opening, it was clear that viewers were connecting quickly and responding enthusiastically to what they were seeing. That said, there’s a rule of thumb in all the arts, whether painting, sculpture, storytelling, poetry, even music: what is quickly accessible may soon pale, while things that take some work to appreciate are likely to go on opening up for years, even a lifetime. There are no settings here to fit the figures to, nothing but a collection of symbolic objects, primarily houses, that tell their points rather than show them. The enigmatic-sounding titles are primarily descriptive: “The Touch,” “Release,” “Dangerous Days.” What is a yearning curve? What appears deep or poetic may be exhausted at first sight, unless viewers fill them in from their own experiences. Like the stunningly effective illustrations that they would make in a book, Fuhst’s paintings will utterly convince when the page is turned to them, but count on the text moving on while they renew that power and await another exposure. If the unified visual character of Grant Fuhst’s imagery contrasts with the diversity of Tess Cook’s representations, Larry Revoir’s entire approach differs from both, and not just in being three-dimensional where theirs use only two. Creatures with childlike, anthropomorphic features that have direct access to us through toys, cartoon narratives, and nursery decor take on universal and significant real-world reference here. These disturbing—to say the least—figurines were considered at length in last month’s 15 Bytes, but now that they can be seen properly, a few observations are in order. A large variety of techniques including multiple and wood firings of the clay produce unexpectedly diverse results, including colors that are bright, scaly, and anything but naturalistic, except when they recall their fiery origins. This gives them a symbolic quality that compounds their already ambiguous relation to life and death. Some, like “Sallow” and “Trope,” are mounted on bases that extend them and suggest more environmental presentations: tableaux or panoramas like those seen in natural history museums. In spite of the horrors inflicted on them, or maybe all the more because of it, they continue to appeal to an audience that acquires the presence of a witness. “Anathema,” all that remains of a bunny perhaps, tilts its head back and looks up with owl-like, gaping eyes, while “Obfuscation” and the painfully aptly titled “Bereft” sit, sagging, as though they died awaiting a loved one’s return. At the beginning of any new art form, of course, there are no rules and anything can happen. Larry Revoir avails himself of this ultimate artistic freedom in July 16, 1945: Enter the Anthropocene. How ironic then, that art with such a promising future predicts, with certainty that is anything but calm or dispassionate, that the life we have known is over. The Finch Lane Gallery presents the works of Tess Cook, Larry Revoir, and Grant Fuhst in exhibitions running through February 26. Thanks again Geoff. And thank you All at 15Bytes! I think I’m very proud of my dear friend! You shine!! It’s so good to see you come into your own that I hardly know what to say, except, Bravo Dahling!! !